This past weekend I had a chance to see the movie Elysium. The story takes place sometime in the near future. The planet earth has been abandoned by the rich due to the violence, the pollution, the disease, etc. The rich have deemed earth to be unliveable. The rich live on an idyllic setting called Elysium. On Elysium there are no illnesses. There is no hunger. There is no pollution. 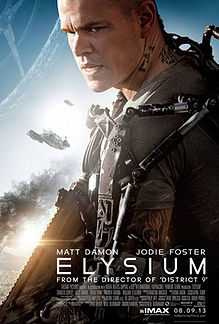 The people living on planet earth long to live like the rich on Elysium. One of the interesting things about Elysium is that they have the technology to cure all illnesses. As I was talking with my brother-in-law about the movie I could not shake the thought that people had the technology and the ability to cure all diseases, and yet they refused share that technology and ability with all people? Why would anyone want to keep such technology for only the few? Why would they only limit healing for the rich? Why wouldn't they use the technology for all who needed healing? What kind of people would be okay with keeping such technology to themselves? And then it hit me like a ton of bricks...we have enough food and technology right now to eradicate world hunger. Not another human being need to ever die again because they did not have enough food. We already have all the food to feed all the people on the planet. We already have the technology and the infrastructure to get the food to the hungry. So here's the million dollar question? Why aren't we doing what we know to be absolutely doable today? Why are people dying of hunger?